Rogue Chocolatier is another small chocolate maker that I discovered at the Good Food Awards. All their bars contain only cacao beans and cane sugar and are single origin. I wasn't all that impressed with any of their offerings. Rio Caribe. 70%, single origin from Venezuela. Tasting notes: somewhat fruity, but forgettable. Hispanola. 70% single origin from the Dominican Republic. Tasting notes: earthy, most complex of their bars that I tasted, nice dark bitterness. Silvestre. 75%. Limited production, made from a small, rare bean from Bolivia. Tasting notes: Fruity, incredibly smooth but less complex, not all that interesting. Last night was Fashion Night out. To celebrate, a number of stores were open late, and hosted parties inside the stores. While most places simply handed you a glass of wine or champagne as you entered, a few had some sweets to enjoy as well. Neiman Marcus had a somewhat strange assortment of treats: Popchips and new fiber Luna bars were their big give aways, presumably because they were sponsors? But they also gave out cookies from the cafe they have on street level, FreshMarket, which sells the "famous" Neiman Marcus cookies. These are a thing of legend, you can go read all about it on Wikipedia. 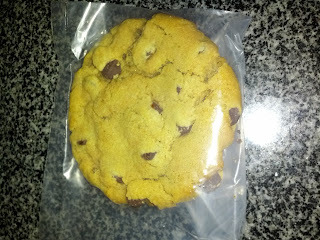 Anyway, they were good cookies, certainly good for freebies, but I wouldn't go out of my way to buy them. This was called a mini cookie, but seemed like a totally normal size cookie to me. 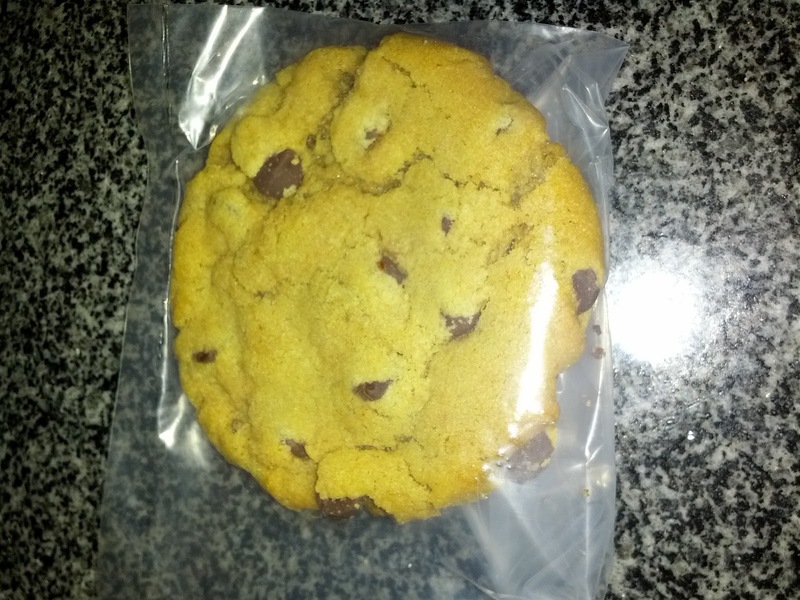 I looked them up online, and found that they are known for the fact that their cookies are huge. So, I guess this was mini in relation to their normal size. Anyway, it was an incredibly soft cookie, almost a little gooey inside. Rich, buttery flavor. Tiny little chocolate chips, good distribution of them. A good cookie for sure, but I probably wouldn't bother purchasing one. I think it would be really good warm and more gooey! Same size as the other "mini" cookie, but besides that, I would have never believed that these came from the same place. 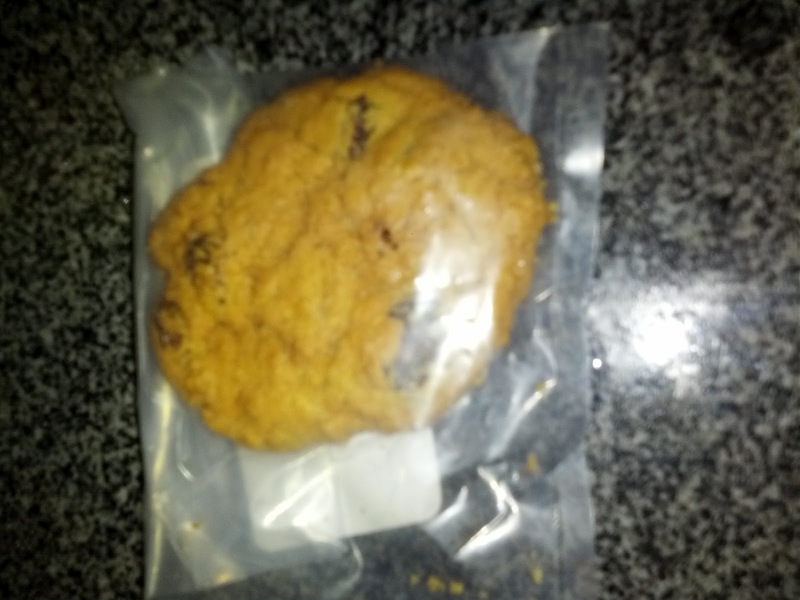 The chocolate chip cookie was super soft, whereas this was crispy as could be. You couldn't break off a piece without the whole thing crumbling into pieces. Definitely not my style of cookie, I prefer soft ones, but the flavor was very good. There was a very balanced sweetness to it, and it had a mix of regular and golden raisins, which added some additional flavor. I liked it, despite the texture, but again, I wouldn't go out of my way for it. I go through a lot of phases. As you know, I spent the entire months of May and June eating foie gras basically every night. Ok, slight exaggeration, but not much. I think I averaged at least 5 out of 7 days most weeks. I didn't get sick of foie exactly, but I did get sick of fine dining. So I've been on a more casual kick lately, particularly inspired by birthday freebies, LevelUp promotions, and GoPago credits. I recently had even more LevelUp money added to my account, to spend at a small number of SOMA specific merchants. Its been burning a hole in my pocket, and I just received an e-mail saying it was going to expire. I just had to go use it. It was a particularly glorious afternoon (yes, San Francisco summer is almost here! ), so I was craving something like ice cream, or ... a milkshake! 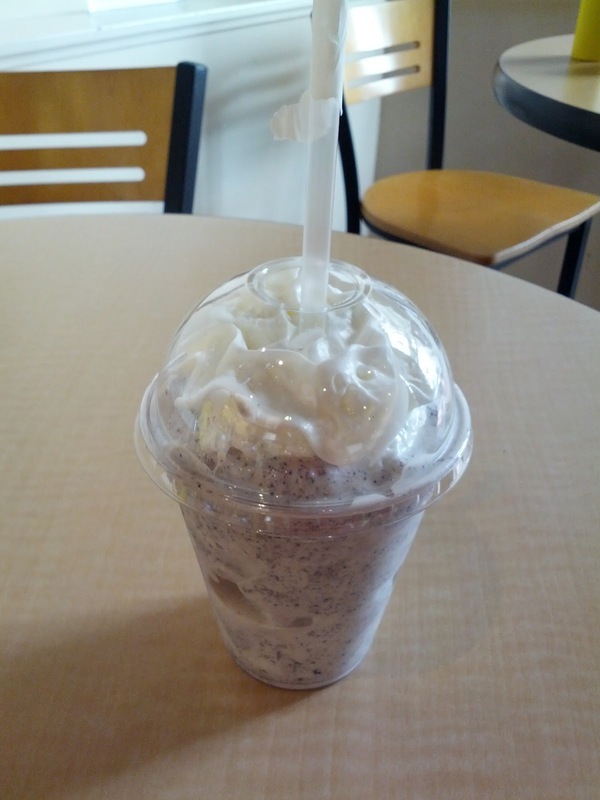 I quickly determined that a handful of the SOMA places had milkshakes, including Bistro Burger. I've walked by Bistro Burger a zillion times, as one location is very close to my house, and there is one in the mall, and there are two others in the FiDi. But I've never been, as the burgers and fries don't look particularly good. But I do always notice the big signs they have out front advertising the shake of the day! I quickly checked out the website, and saw that they offered milkshakes in two sizes, one for $2.99 and one for $4.99. Since I had just over $3 left in my SOMA credits, this was perfect. They also had a number of flavors to pick from. I strolled out into the sunshine and headed to the closest location. The menu listed only the $4.99 size. I asked about it, and the girl told me they come in only that one size. And it was 20 ounces. Now, I like milkshakes, but 20 ounces was a little much given that I'd just had a giant froyo sundae an hour before. And ... I only had ~$3 worth of credits! I told her the website said they had two sizes, and asked if she knew if the other locations carried more sizes. She just shrugged. So, I started walking to the next one, calling ahead on my phone. They also told me they only carried the 20 ounce size. And then I called the mall location, and they said the same thing. Finally, when I thought all hope was lost, the last location told me they have a 12 ounce and a 20 ounce size. Perfect! But ... that location wasn't listed in LevelUp, so I wasn't sure if they actually used it there. And they were closing in 10 minutes. I high-tailed it there, saw the LevelUp device on the counter, and then saw that the menu only listed the large size as well. But, given that I'd just talked to someone on the phone who said they had two sizes, I decided to just play it cool and ordered a "small". The cashier didn't even do a double take, ringing up a "mini shake" for $2.99. Then I went to select my flavor. The online menu listed a bunch of flavors. The first location I stopped at had those, plus a few extras, including Oreo, which sounded appealing, as I'd recently been remembering the Oreo Vanilla Bean Coolatta from Dunkin' Donuts. But of course, the location that I was now at didn't list that flavor. I asked if they had any other flavors, and she told me that the special of the day was coffee. So I specifically asked, "do you have Oreo?" And she said "oh, yeah". So again, why does their menu not list what they actually have? Anyway, I found the whole experience rather frustrating. I don't understand why only one location has both sizes, perhaps the others do as well, and it just depends who you ask? And I don't understand why it isn't listed on the physical menus anywhere. Or for that matter, why it is on the online menu if they don't really offer it. I later tweeted to Bistro Burger asking about the sizes, and got a reply that two of the locations should have the smaller sizes (Sansome and Bush), and that the others just don't have the facilities to make them yet. I appreciated them looking into this for me! This was a pretty generic shake, made with Dryers ice cream. I'm pretty sure it was vanilla ice cream and crushed Oreos blended in, rather than just an Oreo flavored ice cream made into a shake. I give them credit for that. It was incredibly thick at first, somewhat hard to drink. As it melted, it then turned into just thin milk. It didn't ever seem to be at the perfect consistency. 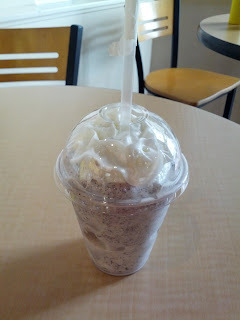 There was a plentiful amount of Oreo in it, which was great, except that kept clogging up my standard size straw. It would be better to serve with a large straw, or break the pieces up more. Given that I enjoyed the chunks of cookie, I'd opt for a larger straw. The whipped cream on top was generic, but a nice touch. Overall, this was nothing special, but $2.99 for a 12 ounce shake is actually very reasonable for SF. I liked it more than my free birthday shake from Del Taco, as it was at least made from real ice cream, but the one I had a few weeks ago from Roxy's Cafe was definitely better. One of my co-workers had his $3 worth of bonus GoPago credits expiring, and knowing how much fun I've been having using LevelUp and GoPago, he offered it to me. Since I didn't want to steal his phone for too long, I choose a place just a block from the office: Little Saigon Deli. 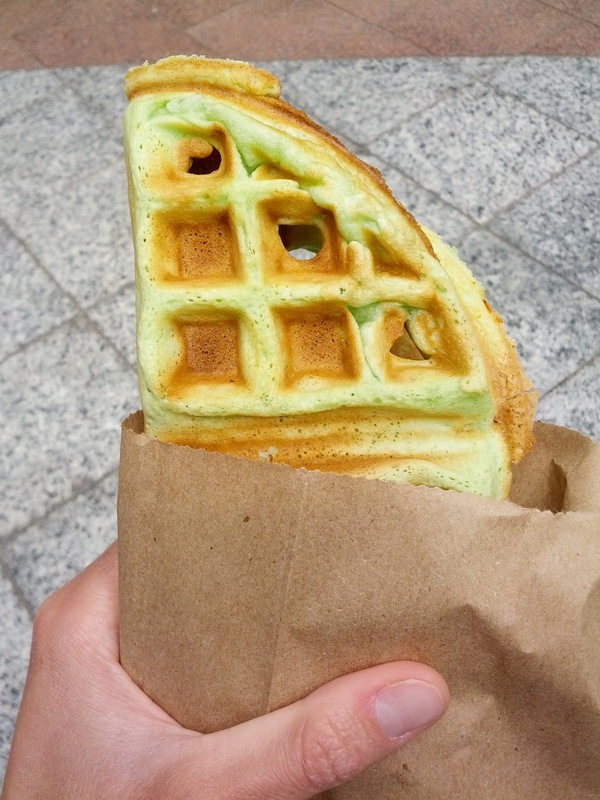 I've walked by the tiny shop a zillion times, and when I browsed through menus and reviews of nearby businesses on GoPago, it stood out due to the very enthusiastic reviews of one item, the Green Coconut Waffle. And, at only $2, it wouldn't exceed the free credits! It was a bit of a GoPago fail. On Monday, it was listed as open, which surprised me as the entire neighborhood was shut down for Labor Day. I smartly walked there first before ordering, and of course, it was closed. Ok, somewhat understandable, although many places were listed as closed in the app, even though they are normally open on Mondays. So on Tuesday, I placed my order as I headed out the door, eager to receive my waffle fresh out of the waffle iron without a wait ... the GoPago way! I arrived and ... they were closed. But the credits had been deducted from his account. I could hear the GoPago chimes going off inside the store. I was very grumpy, as I was really wanting a snack, and I didn't have time to make an alternate plan, since I needed to be back in the office for a meeting. Also, the credits were taken out of his account, since GoPago thought the order had been placed. I looked through the UI for a way to take back the order, or to report the place closed, or something, but I couldn't find anything. I quickly searched the help pages, and couldn't find any solution. So I grumpily walked back to the office, went to my meeting, and munched on nuts. A little while later, his phone got a notification that GoPago figured out that they didn't actually deliver my order, since it was never confirmed on their end, and the credits were restored. Thank goodness! I'm glad they had that check in place, but it took a while, and I would have liked a way to report the problem myself. You'd think I'd give up at this point, but ... I'm a determined girl. So on Wednesday, when the credits were supposed to expire, I begged him to borrow his phone one more time. This time, I called first, to verify that they were open. And then, and only then, I placed my order. Success, finally. Of course, I had a slight issue picking up the order, as it wasn't my account. I did have his phone with me, but it had his picture, and uh, I clearly wasn't him. I explained to the worker that it was my co-worker and she didn't have too much of an issue with it, but she might have thought I had just stolen someone's phone. Perhaps this whole ordeal was just bad karma for sorta breaking the rules? The waffles are cooked fresh to order. The aroma of the cooking waffle when I approached was downright amazing. I enjoyed my several minute wait, just inhaling the delicious smells. From the Yelp reviews I'd read, I knew to request it "extra crispy", which I was able to easily do using GoPago. I'm not certain my request was seen though, because I would not have called it crispy. My favorite thing about waffles is the crisp exterior and moist fluffy interior, and this had neither. The outside wasn't crispy, and the inside was gummy. The flavor was fairly interesting, although I didn't really taste the coconut. The pandan flavor was strong though. 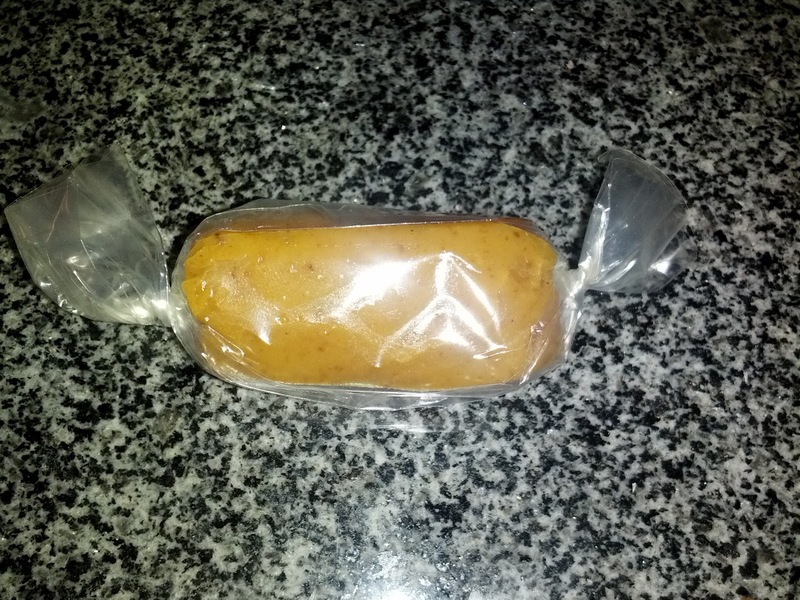 It was served folded over, in a little paper bag, making it appear smaller than it was. This was a full waffle. Anyway, the textures were just all off for me, and I wouldn't get again. I've been having fun over the past few weeks using my credits from LevelUp, particularly when businesses are running special promotions and adding even more free credits. This past week, a cupcake bakery that I'd heard about ages ago was running a promotion where they gave $10 to spend. Since I'd wanted to check them out at some point anyway, this was a great motivator to finally do so. Their full size cupcakes are $3.25 and the minis are only $2.15, so this allows one to try a lot of cupcakes, particularly if they combine forces with another LevelUp user! (which, I obviously did, and visited several times this week). The always have a few classic flavors (vanilla, chocolate, red velvet, etc) and then rotate through other flavors daily. 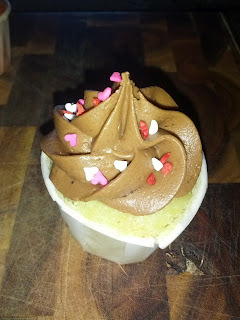 The website has a cupcake calendar listing which flavors will be offered on any given day, so you can prepare. They also carry a few different cookies and caramels. Yelpers seem to generally love these cupcakes. I really don't see why. Yes, they have some interesting flavors, and the minis are a nice size and reasonable price, but the cupcakes themselves are just not very good. Each and every one had incredibly dry cake, and way too much way too sweet frosting. Maybe I'm just spoiled by getting awesome cupcakes at work all of the time, but this place is a cupcake bakery, they should do better than this! The service was really great however, and I really liked the staff on each visit. They were friendly, chatty, and really quite nice. I'd almost go back just because I liked them so much. Peppermint Patty: Chocolate Cake, Peppermint Buttercream Filling, Dark Chocolate Ganache, Green Swirl. $3.25. I got this one for someone else, but I couldn't resist trying a bite. This was a full size cupcake. 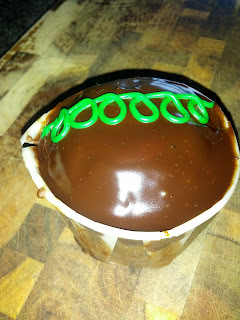 The ganache was pretty generic, runny, with decent chocolate flavor. The cake was dry and uninteresting. The bite I had didn't have any of the peppermint filling, but he said that there actually was a ton, it just wasn't centered in the cake. I didn't care for this at all, but, I did only have that one bite. Strawberries & Champagne, mini: Strawberry Cake, Champagne Buttercream. $2.15. 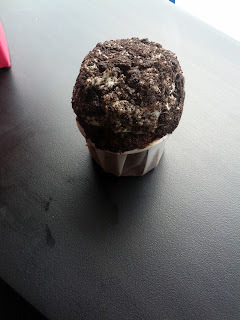 The first mini cupcake I tried. The cake was again pretty dry, but it did have a nice strawberry flavor to it. The frosting on top was hard and not very creamy. I did not detect the champagne flavor, just found it to be fairly sweet. I liked the crunch from the little balls on top. This cupcake was ok, but nothing special. I did like the balance of flavors, and it wasn't too sweet. I'd eat another one if someone gave it to me, but I wouldn't go purchase one. My favorite of all that I tried. Bella Nutella, mini: Vanilla Cake, Raspberry Filling, Chocolate Hazelnut Buttercream. $2.15. And another fairly dry, uninteresting cake part. And more hard frosting. I didn't taste the hazelnut in the frosting. There was also more frosting than cake. The raspberry filling was sweet and fairly flavorful, and it helped add moisture to the otherwise dry cake. The filling was the best part of this cupcake. I didn't like this much, and would not get again. 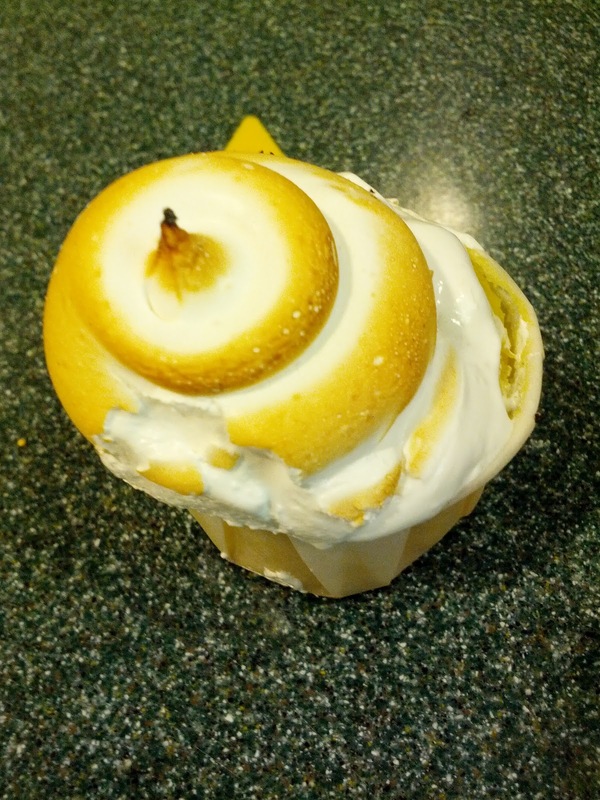 Lemon Meringue Pie, mini: Sweet Lemon Cake, Lemon Curd Filling, Toasted Marshmallow Frosting. $2.15. The toasted marshmallow frosting was incredibly sweet, but I liked the creativity of something other than buttercream frosting. It looked like meringue, but it was far sweeter than any meringue I've ever had. I kept wanting to like it, since I love meringue, but it was just too sweet. There wasn't much lemon curd filling at all, just a tiny dollop in the top center. Perhaps this was due to being a mini cupcake and they can't fit much in? I really wanted more of it, as I could barely taste it at all. It was sweet and lemony, although it also had a strange eggy flavor to it. And the cake, was again, very dry. It had a very slight lemon flavor. 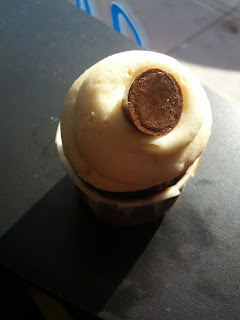 I wouldn't get this one again, although it was a fairly interesting cupcake. 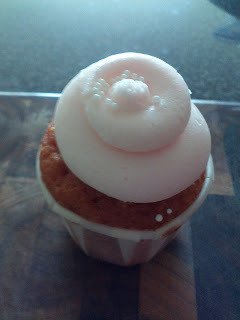 Luscious Vanilla, mini: Vanilla Cake, Vanilla Buttercream. $2.15. Given my other reviews, you can probably guess how this is going to go. Dry, uninteresting cake. Didn't really taste vanilla. Hard buttercream, and more buttercream than cake. 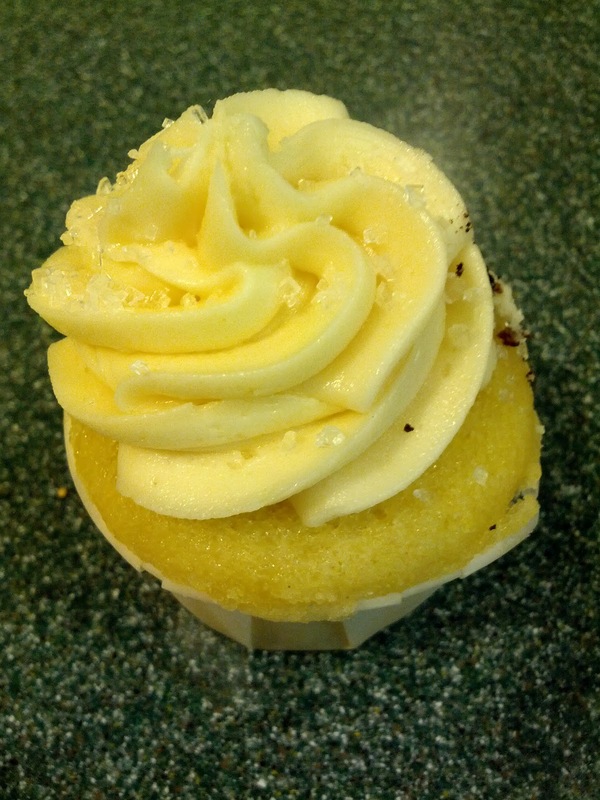 The buttercream was very sweet, but did have a strong vanilla flavor. Perhaps I would have liked this with a scoop of ice cream or something, but on its own, it was very boring and generic. Would not get again. Vanilla Buttercream, Chocolate Cookie Crumbles. $3.25. Cookies & Cream, mini. $2.15. And yet another, dry, uninteresting chocolate cake. The buttercream was very sweet, not really all that vanilla-y, but went well with the cookie crumbles the cupcake was rolled in. Had the cake part of this been moister or more chocolatey, this could have been pretty good. Peanut Butter Cup, Mini. Chocolate Cake, Peanut Butter Buttercream, Mini Peanut Butter Cup. $2.15. I got this one on election day, as they were giving out free mini cupcakes if you wore your voting sticker. Like all the others I tried a few months ago, the cake was again dry and not very good. I did like the peanut butter buttercream, although, again, like the others, it was kinda hard and not really creamy. I mostly just love peanut butter :) The little peanut butter cup on top was a cute touch. Rich Red Velvet, Mini, Red Velvet Cake, Cream Cheese Frosting. $2.15. I'm never a huge fan of red velvet, but they were giving these out at my office one day, so I tried it. The cake was again not very moist nor flavorful. The cream cheese frosting had mild cream cheese flavor, but nothing special. 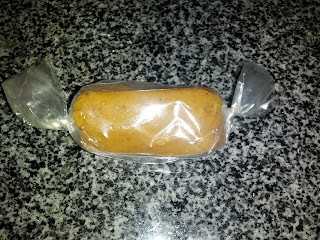 This was a soft style caramel. It was ok. I liked the salt level in it and it went well with a cup of coffee. Some of my adventures in using free LevelUp credits have been quite successful, and I've discovered some new places I'm excited to return to. Most have been fairly mediocre, places I won't return to, but weren't bad, particularly for some free stuff :) And others ... others are horrible. I recently had some really good falafel, and I've been craving it ever since. I was wanting a snack, so I pulled out LevelUp, and found a place offering falafel that feel within the free credit budget. Done! I could have guessed pretty instantly that this wasn't going to go well. They were a pizza place, and they had shwarma (duh, I guess this is obvious from the name), and of course, the falafel. Somewhat of a strange mix, but I gave them the benefit of the doubt. Service was beyond horrible. I placed my order at the register. And then, I was ignored for about 10 minutes, while I stood there. I wasn't rung up, or told anything. They made pizzas, answered the phone, did a slew of other things. 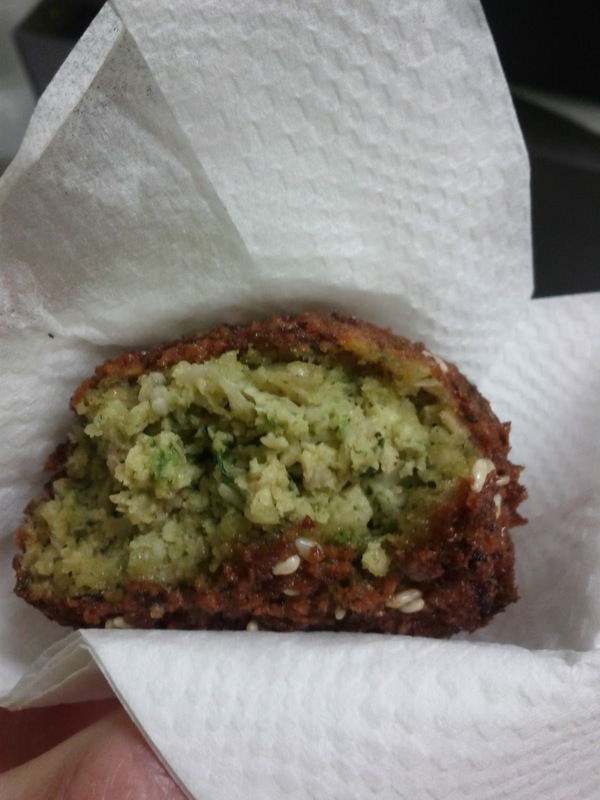 Eventually someone comes out with my falafel and hands it to me wordlessly and walks away. I mention that I haven't paid yet and need to do so. He grunts the price at me, and I say I'd like to use LevelUp. He seemed very angry at this point. The phone that they used for LevelUp wasn't plugged in and the battery was dead. He asked me to use cash, which I didn't have. He plugged the phone in, but the battery was so dead that it wouldn't turn on. He told me it would take a while, and I said that was fine, I'd go sit and eat my falafel and come pay when he was ready. He told me no, that it would take too long. I asked if he knew of an ATM nearby. He said no. I again told him it wasn't a big deal, I could wait for the phone to charge and boot up, but he was pissed at this point and told me to just take it and go. This was not good. Super oily, flavorless. It did have a good crust. Will not ever get again. I've been having a lot of fun using LevelUp credits to get random free sides for my meals. Many businesses seed it with ~$2 to lure you in, since most of the time, you can't actually get anything for the initial free money. But ... I've been enjoying the challenge of using just the free money - I'm now an expert on where you can get chips, cookies, or drinks for <$2! It is actually amusing to see how much variety there is in pricing (if you care, Kettle Chips seem to have the most variance, from $1.25 - $2.25!). Anyway. I also had a little extra credit just to spend at SOMA establishments, and I also decided that I'll spend real money on tax, so I will buy items up to the $2 limit, and then pay the 16 cents tax. I did both of these tactics at Tokyo Express. There are a bunch to sushi places on LevelUp, but I can't say it is a good thing for anything at a sushi place to be <$2. That is most likely fish I want NOTHING to do with. I did find some ok tamago at Sushi Fantastic (although it was $3, even though the menu said $2 .... grumble). And I was pleasantly surprised to see that Tokyo Express had a happy hour at one of their locations, with radically reduced prices. Score! I visited two different Tokyo Express locations, one has the happy hour and is located right near the Westfield mall, and the other closes earlier in the day and is located closer to my office. They are both order at a counter and then sit casual places, but I got my food to go at both locations. Service was friendly at both. 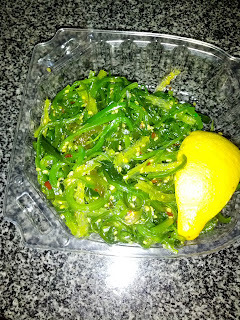 Happy Hour Seaweed Salad. $2.50 (normally $4.25). 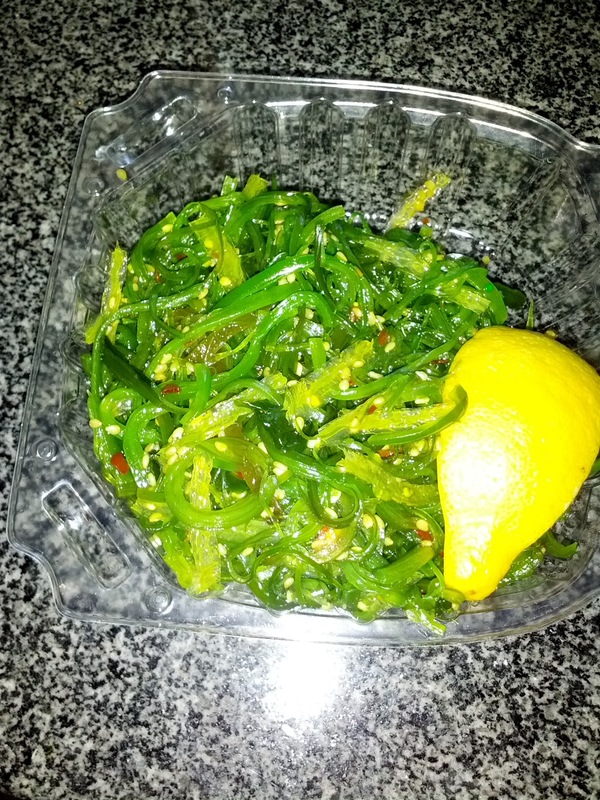 This was a standard seaweed salad, with a variety of different seaweeds, all decently crisp. Not the most flavorful dressing, but there was some seasoning. Perhaps too many sesame seeds. This was a happy hour special, normally $4.25, but only $2.50 at happy hour. The happy hour price seemed good, I wouldn't have wanted to pay $4.25 for this. I probably wouldn't get again. 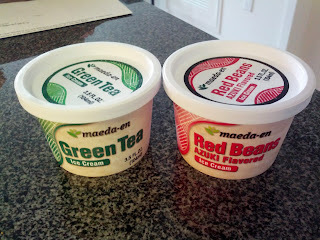 Green Tea Ice Cream, Red Bean Ice Cream. $2 each. At the other location, I saw they had ice cream! I've been on a serious ice cream kick lately, so I eagerly snatched these up. I foolishly expected house made ice cream, or locally made at least, and was rather surprised to find the Maeda-en pre-packaged ice creams in my bag. Whoops. I'm forgetting the calibre of places I'm visiting! Both ice creams were pretty generic. The green tea had a nice flavor, but was a little bit icy and not creamy. It seemed like it had been thawed and re-frozen or something. The red bean had chunks of azuki beans in it, and wasn't too sweet. 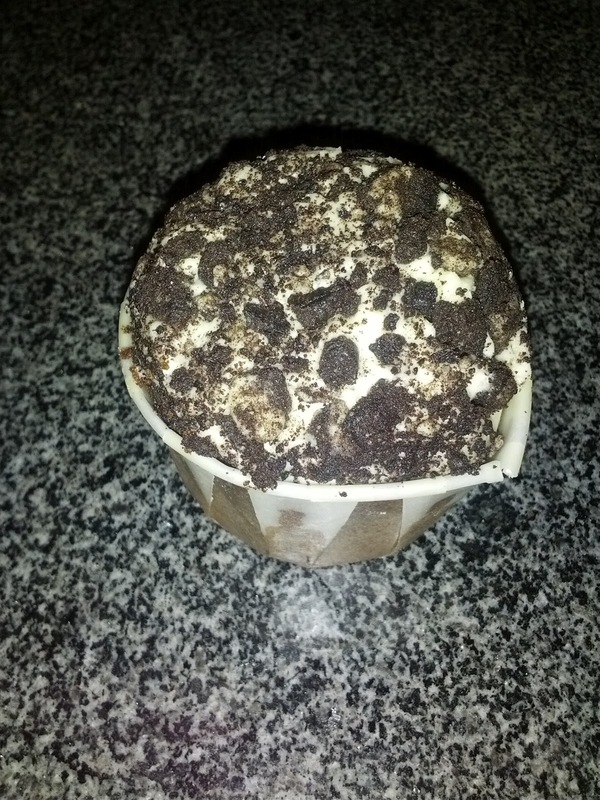 On its own, a little too savory for my liking, but I liked mixing the two ice creams. This one was a better consistency. If I was really craving these flavors of ice cream I'd consider getting again, but they certainly weren't anything special. $2 was reasonable for a little container of ice cream. Amusingly, my togo bag, both times I got the ice cream, contained the ice cream and ... chopsticks. I'm guessing that is the only togo cutlery they have? It was rather fun to try to eat some ice cream with chopsticks. Thank you Tokyo Express for helping me to develop new skills!